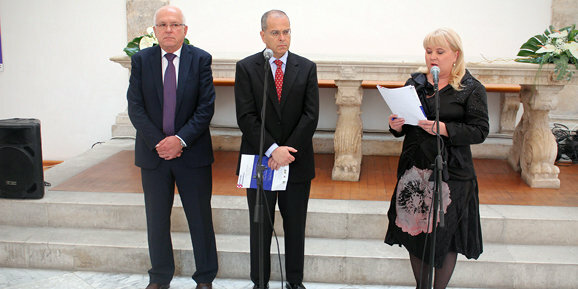 The exhibition Righteous from Croatia organized by the International Raoul Wallenberg Foundation, Casa Argentina en Israel Tierra Santa, and the National Museum Zadar, was inaugurated on November 8th, 2011, in the city of Zadar, Croatia. His Exellency Yosef Amrani, Ambassador of the State of Israel in Croatia; the Honorable Zvonimir Vrancic, Mayor of Zadar; and Ms. Renata Peros, Director of the National Museum Zadar, all took part in the opening ceremony. Director of the National Museum Ms. Renata Peros gave a speach welcoming the guests and pointing out what a special honor it was to host the exhibit in the most eminent exhibition space in Zadar. On April 17th, 1941, the Kingdom of Yugoslavia was entirely occupied by Nazi Germany and partitioned into provinces under German, Hungarian and Italian rule. The majority of the Jews from Croatia found themselves in the Independent State of Croatia, a Nazi puppet state declared on April 10th, 1941; while the ones living in central Dalmatia were under Italian rule. After the declaration of the Independent State of Croatia many racial laws were passed targeting Jews, Serbs, and Roma populations, followed by large-scale genocide campaigns. The Righteous from Croatia presents isolated cases of 39 people, part of a group of 106 men, women and teenagers, who showed solidarity with the persecuted Jews. “The humanitarian actions of these people were not done out of courage, but as answers to the question of moral responsibility – the only right thing to do. It is especially important for young people to visit this exhibition as our goal is to convey this message to future generations,” said H.E. Yosef Amrani, Ambassador of the State of Israel in Croatia. Among the guests present at the opening were Vitomir and Ivica Buterin, sons of Mate Buterin, one of the Righteous from Croatia, whose case is presented at the exhibit. Previously organized in Buenos Aires, Argentina, at the initiative of the Croatian Embassy in that city, this is the first time that the Righteous from Croatia is exhibited in Croatia. For their help in organizing the exhibit, the International Raoul Wallenberg Foundation, Casa Argentina en Israel Tierra Santa and the National Museum Zadar would like to thank to: Yad Vashem; Mrs. Miriam Steiner Aviezer, researcher and member of the Committee for the Recognition of the Righteous and the author of the book “Righteous from Croatia”; Mr. Zvonimir Vrancic, Mayor of the city of Zadar; Ms. Renata Peros, Director of the National Museum Zadar; Ms. Mira Martinec, Ambassador of the Republic of Croatia in Japan; Ms. Nikolina Zidek, Head of the Consular Department of the Embassy of the Republic of Croatia in Buenos Aires; and the Angelo Roncalli Institute, New York.